The Crouch - pic by aluytenuk. Quite the best part of Roddick v Gimelstob on Monday afternoon was Hawk-Eye doing its stuff. Court 1, first day: Two enormous men, in enormous shorts, face up to each other across a half-size tennis court. 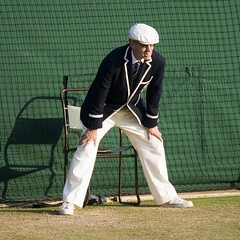 One bounces a ball on the turf and straightens up; the line judges take up their ludicrous Wimbledon Crouch. The ball is tossed into the air, Serve! Thwack! A flash of agassi-belly, "FAULT!" "15-30"
But what's this? Instead of retiring meekly, a player apologetically raises his hand. "Mr Gimli", intoned the referee incredulously, "Mr Gimli, son of Thimli, son of McEnroe, is challenging the line call! ", then adding rather needlessly: "the call made was: 'out' ". It was the first ever Hawk-Eye challenge at Wimbledon (and I was there) The crowd loved it. The offending line judge hated it. How he squirmed in his seat as Hawk-Eye blinked into action ("Hawk-Eye operator, actually". Wouldn't that be a great response when quizzed at parties?). On the big screen a virtual No 1 Court appeared and we gasped as our virtual pov zoomed, dizzily, like google earth, down, down until we took up position a few virtual centimetres above the virtual grass, to see exactly where the virtual ball would bounce. In came the ball. In the background a tiny, virtual line-judge leapt from his virtual seat and a speech bubble yelled 'OUT', but in the foreground we could all see the virtual ball just touching the virtual line - it was in. Although personally I wasn't convinced: no cloud of virtual dust, see. Great fun but, at its heart, not entirely honest, for this isn't really a replay. The system isn't really watching to see whether the ball is out or not. It already decided that. This is an animation. It follows the decision, not the other other way round. Wimbledon sorts people: Centre Court, No.1 or Outside Courts? Members' Enclosure, Debenture Holders' Enclosure or Henman Hill? Food Village, picnic or Pimms & Champagne bar? Mrs B and I know where we stand, and we headed for the last-named, and a glass each of watery Pimms (no, sir, no Margaritas) where we watched the people. Young people, old people, all middle-class people. To our left a couple were kissing quite passionately, his hand on her leg. The rings on their fingers, showed they were married but not, opined Mrs B confidently, to each other. They were oblivious to our gaze. Over their heads, on the big screen, a virtual tennis player tucked a virtual tennis ball into her virtual knickers. One day they'll probably have Hawk-Eye in the bars as well. very entertaining. Did you actually see any Real Tennis?